©Bert Gildart: On the back porch of our yard we have three items intended to attract birds. The items: a standard bird feeder into which we place various types of seeds; a hummingbird feeder into which we place sugar water; and a “cage” into which we place suet. The items are all placed within several feet of one another and with them we’ve attracted about 40 different species. The pleasures we derive from such simple investments are immense. Most frequently we attract chickadees, wrens, and blackbirds but in the past few days our feeders have been luring in Crossbills and Grosbeaks—and much to our surprise, the Rose-breasted Grosbeak, which is normally confined to areas east of the Continental Divide. The male is dark red on the underside of its neck and wings, and with the complementary colors of black and white is simply one of the most colorful birds I’ve ever seen. So far, it has eluded my camera set ups, but if it sticks around I have hopes that persistence will pay off. Stay tuned. Our feeders have also attracted the Eastern Blue Jay, rare in the valley and its presence convinces us that something is happening in regards to our climate. 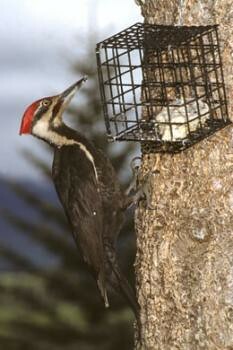 As well, we’ve attracted the Pileated woodpecker, one of the largest of all woodpeckers and one we now recognize from a unique call our Peterson Field Guide describes as kik—kik—kikkik. That may come close, but the call is loud and once you’ve seen the bird and the call together you won’t forget it. Because we’ve located this huge woodpecker with binoculars high overhead in the cottonwood that graces the far side of our property we also know it nests on our one small acre of land. Our bird book tells us that hummingbirds are among the most pugnacious of bird species, and as we watch two males bombard one another, we can certainly concur. 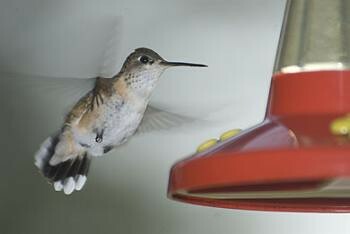 Rufous are among the smallest of hummingbirds, weighing in at about 0.1 ounce and measuring between 3 and 4 inches. Because of its size and fast-paced life, it has one of the highest rates of metabolism of all animals, a necessity in order to support the rapid beating of their wings, which can reach well over 50 beats per minute. Heart rate may soar to 1,260 beats per minute. Phenomenal! Watching the birds move back and forth at our feeder prompts interest and so we continue our research, learning that these tiny birds are hours away from starving. To conserve energy, at night they reduce their metabolism, and if food is not readily available, they enter a state known as torpor. During torpor, the heart rate and rate of breathing are both slowed dramatically (the heart rate to roughly 50-180 beats per minute), reducing their need for food. Other species lured to our feeders include the crossbills, and if you look closely, you might notice that one mandible crosses over the other, naturally. The arrangement enables the species to shear nuts and seeds. 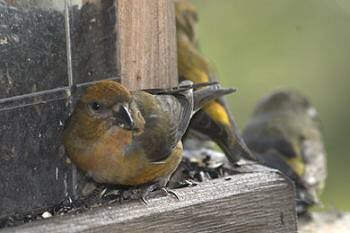 Males are red, so this is a female Red Crossbill. Bird feeders and the birds attracted to our feeders provide us with much pleasure, almost as much as watching huge waves of birds lift off wildlife refuges such as Bosque Del Apache in New Mexico or Freezeout Lake here in Montana. The difference is that one is fleeting, the other sustained—and the latter occurs in your own backyard. This entry was posted on Wednesday, May 16th, 2007 at 7:24 pm and is filed under Natural History/Conservation, Photography. You can follow any responses to this entry through the RSS 2.0 feed. You can leave a response, or trackback from your own site.